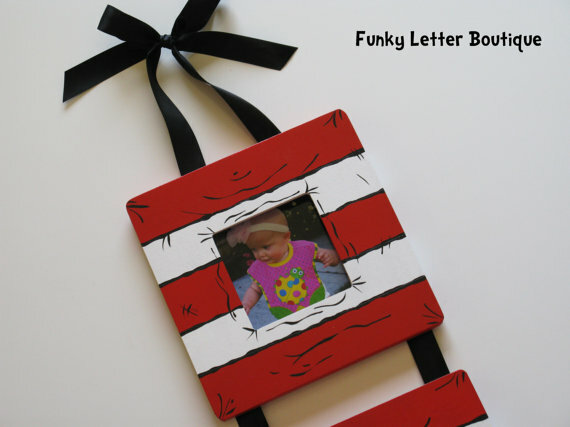 Hand painted frames made to match Pottery Barn Kids or any Dr Seuss nursery/big kids room. These are attached with black satin ribbon. By far the Cutest way to hang your precious photos in a Seuss themed room! Check out my store for more one of a kind hand painted Seuss decor items! Please allow 2-3 weeks for delivery. Rush orders are available for an additional fee contact me for cost. Please keep in mind that these items are completely handmade I do every last detail on my own including cutting and prepping them for paint. A lot of time and care is put into my items. No items are premade. Shipping insurance is available and highly recommended please add to your order if desired.